There is nothing more delicious than quality Dark Chocolate. On our recent trip to Switzerland we tried some of their famous Swiss Chocolate but realized we could also make excellent Primed Dark Chocolate varieties ourselves. Here is one of our inventions but feel free to adapt and add other quality ingredients to suit your taste. 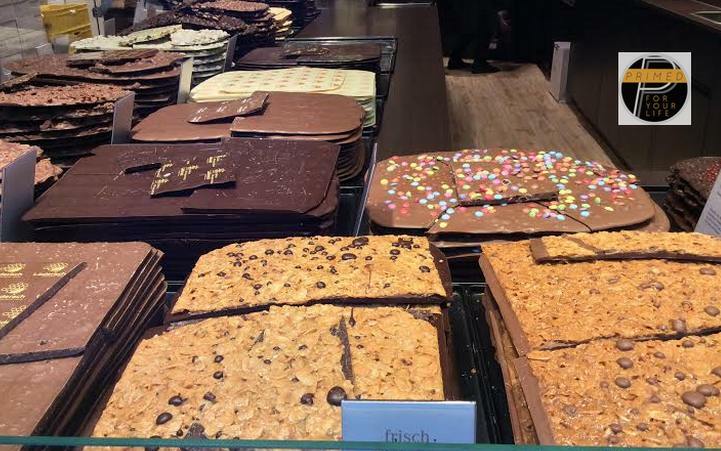 A beautiful Swiss Chocolate Shop in Geneva. 1. Get the rind from your 3 oranges. 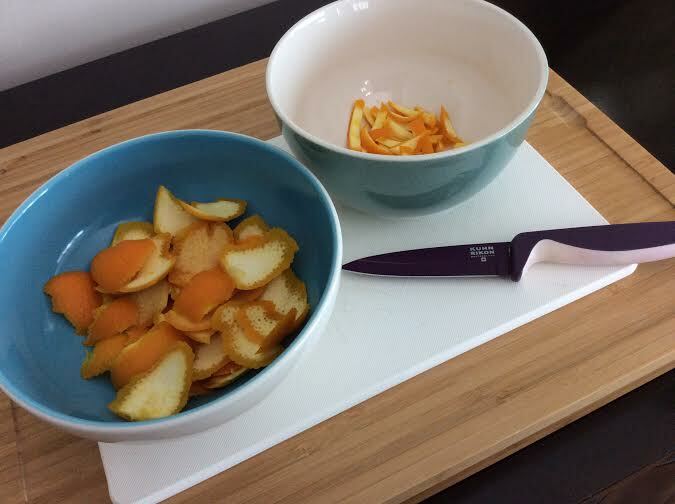 See picture above where you wash and trim the orange rind to have the outer skin part and some pith (white part) and cut into strips. Place them in cold water, bring to boil and then drain. Place again into clean cold water and bring to boil again. 2. Mix 1/2 cup of water and 1/2 cup of coconut sugar in a bowl as you heat a little over low heat for 5 minutes until sugar is dissolved. 3. 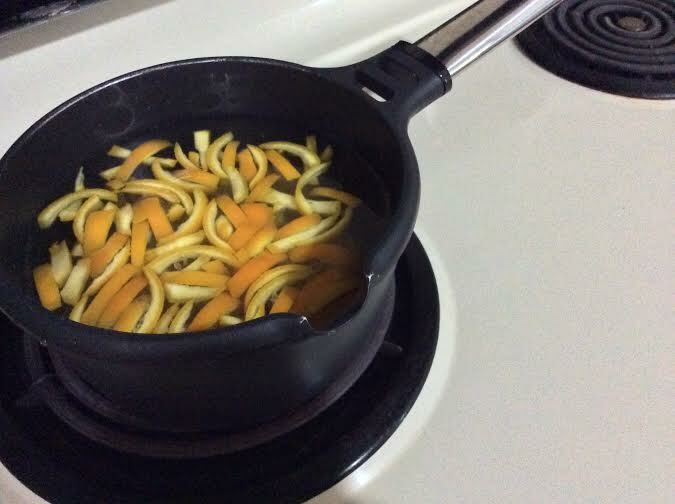 Add your orange peel into your mixture as above and leave to simmer for 40 minutes on a low heat of say 2 out of 10 on your stove top. 4. 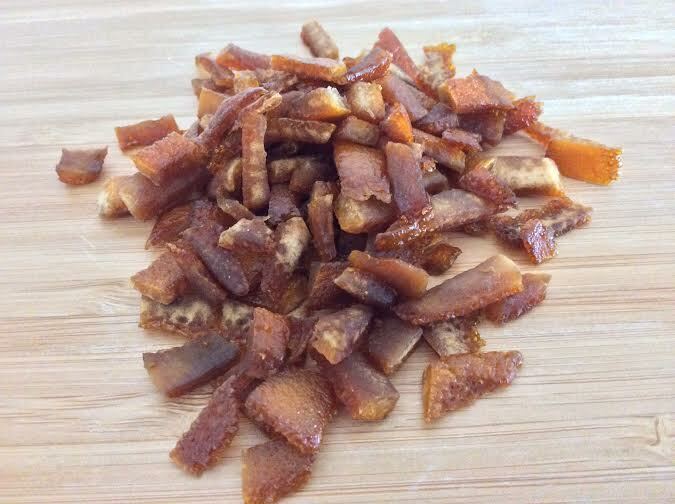 After 40 minutes drain off liquid and set candied peel aside. 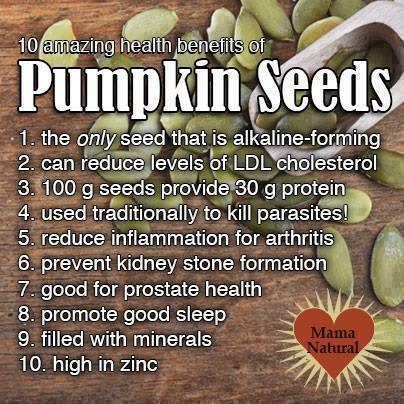 You can keep the drained liquid for cakes and other desserts. 5. With the drained candied orange peel place it on a tray and place in a pre-heated oven of 100 degrees celsius. 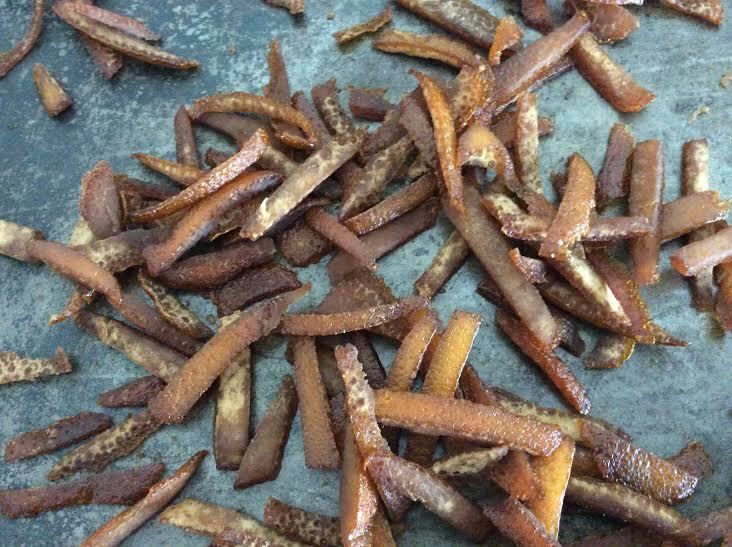 Allow around 40 minutes for the candied orange peel to dry. 6. You can then cut your candied orange peel into your desired size. 1. 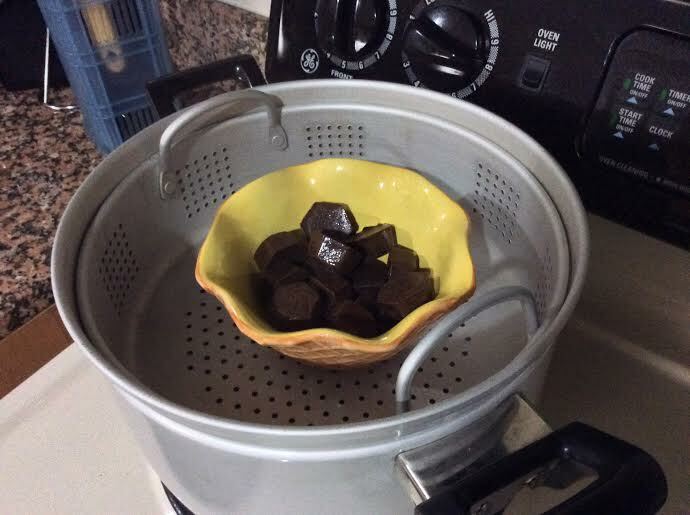 Melt your 100% dark cacoa chocolate over steaming water as shown below. Ensure it is just melted as you do not want to overheat the chocolate. 2. Stir in your 1/2 cup of coconut oil and then your coconut sugar (3 tablespoons). 3. 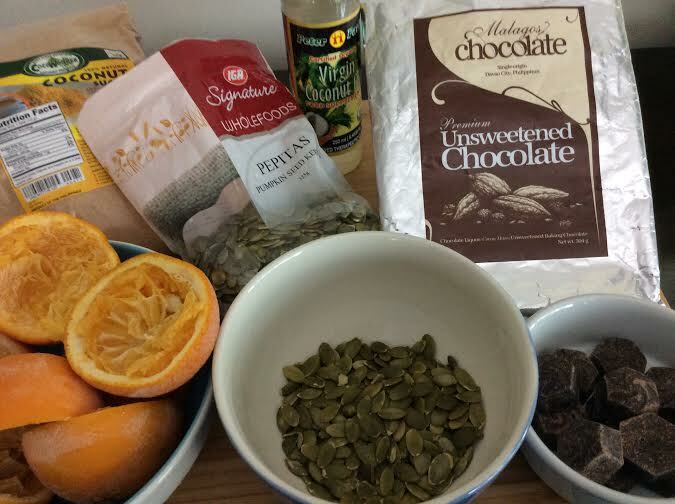 Once stirred in then add this chocolate mixture into your candid orange and pumpkin seeds. 4. 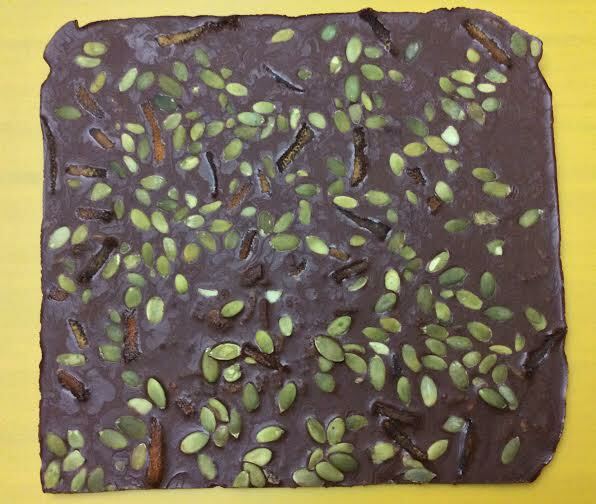 Transfer your candied orange, pumpkin seeds and chocolate mixture onto a baking sheet and spread evenly. Then place into the fridge. The white part of the rind, called the pith, has nearly the same amount of vitamin-C as the flesh and contains sources of pectin. 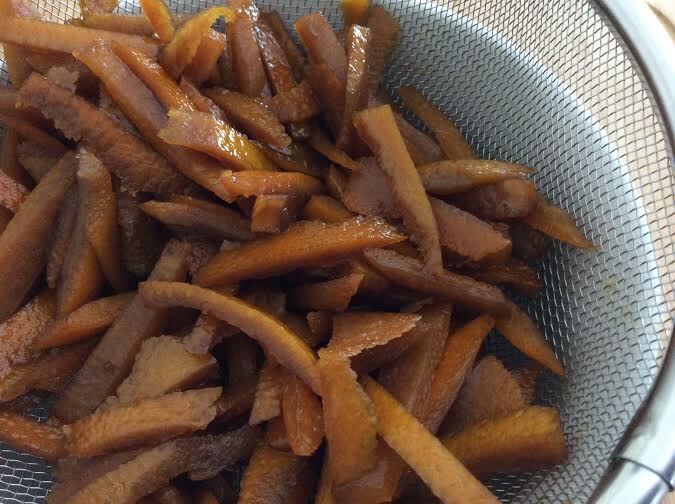 Pectin is a soluble dietary fiber with potential to lower serum cholesterol, relieve diarrhea, act as an immune system stimulant and as anti-ulcer agent. Information from this source. Hence, try and not waste your orange peels (and lemon too) as they are valuable sources of nutrients and can be utilized in many different ways.